Wild poliovirus has been detected in the sewers of Brazil and Israel. Fortunately, no cases of poliomyelitis have been reported in either country. Why is poliovirus present in these countries and what are the implications for the eradication effort? 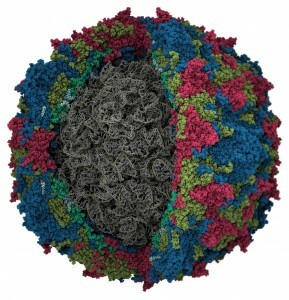 Wild type poliovirus (e.g. not vaccine-derived virus) was detected in sewage samples that had been collected in March 2014 at Viracopos International Airport in the State of Sao Paulo. Wild type poliovirus had not been detected in Brazil since 1989 when the last case of poliomyelitis was reported in that country, and has not been found since March 2014. Sequence analysis of the RNA genome of the wild type poliovirus found in the Brazilian sewer indicates that it is closely related to an isolate from a case of poliomyelitis in Equatorial Guinea. It seems likely that this virus was carried to Brazil in the intestine of an infected person who did not have symptoms of paralytic disease (only 1 in 100 poliovirus infections lead to paralysis). This individual might have traveled from Equatorial Guinea to the Brazilian airport where use of the bathroom lead to introduction of poliovirus into the sewer. There have been 8 reported cases of poliomyelitis in Equatorial Guinea in 2014, from which we can extrapolate that there have been approximately 800 infected individuals. Given the number of cases of poliomyelitis that have been reported globally over the past 20 years, it is surprising that virus has not been detected previously in Brazilian sewage, especially at the airport. I suspect that wild type poliovirus would be detected in sewage in the US, given the number of individuals who enter that country each day. However the US does not conduct routine surveillance for poliovirus in sewage. Brazil utilizes the Sabin vaccine to control poliomyelitis, and in the past 8 years over 95% immunization coverage has been achieved. The Sabin vaccine is taken orally and replicates in the intestine where it induces mucosal immunity. The intestine of Brazilians do not support the replication of wild type poliovirus, which is why the presence of wild type virus in sewage is not a threat – it is unlikely to spread in the population. The isolation* of wild type poliovirus from sewage and from stool samples in Israel is a far more serious matter. As with Brazil, there have been no reported cases of poliomyelitis in Israel since 1989. Yet ten different sites in central and south Israel have been persistently positive for wild type poliovirus since February 2013. Wild type poliovirus has been found intermittently at 8 of 47 different sampled sites in southern and central Israel, and in stool from healthy persons collected in July 2013. Two major lineages of wild type polioviruses currently circulate in endemic countries: the South Asian (SOAS) lineage in Pakistan and Afghanistan, andthe West African lineage in Nigeria. Nucleotide sequence analysis of the wild type poliovirus isolates from Israel indicate that they are closely related to the South Asian lineage, and in particular to polioviruses that circulated in Pakistan in 2012 and in Egypt in 2012. Molecular clock analysis of the sequences indicate that poliovirus was probably transmitted in 2012 from Pakistan into Egypt and Israel, and then spread in the latter country. The central point of poliovirus circulation is within Bedouin communities in the south of Israel. The main virus reservoir within this community is children less than 9 years of age who had been immunized with inactivated poliovirus vaccine (IPV). This vaccine has been exclusively used in Israel since 2005, with overall vaccination coverage between 92-95%, and 81-100% within individual districts. The last nine birth cohorts in this country have been immunized solely with IPV. The response to isolation of wild type poliovirus in Israeli sewers was to complete IPV immunization of all children in the south, raising coverage to above 99%. Then from August 2013 onwards, all children up to the age of nine years old were given a dose of bivalent oral poliovirus vaccine (OPV) containing types 1 and 3 poliovirus. All children who received OPV had previously been immunized with IPV, a strategy that prevents vaccine-associated poliomyelitis. The finding of sustained circulation of wild type poliovirus in Israel shows that the virus can circulate silently in a population that has been well immunized with IPV. Such circulation occurs because IPV does not sufficiently protect the intestinal tract against poliovirus infection. However poliomyelitis does not occur in such populations because IPV-induced antibodies in the blood prevent virus invasion into the central nervous system. The US now exclusively uses IPV and it is likely that wild polioviruses are present in US sewage, although as mentioned above the US does not search for poliovirus in sewage. Silent circulation of wild type poliovirus in countries that use IPV poses a threat to other countries where immunization coverage is low. These findings indicate that immunization with IPV will not lead to eradication of wild type poliovirus. This observation is problematic because the World Health Organization has recommended a gradual shift from OPV to IPV. In the past I have also supported such a transition, but I have also remained cautious about the ability of IPV to immunize the human gut. The experience in Israel confirms my suspicions. The US shifted from using OPV to IPV because the associated vaccine-associated poliomyelitis was not acceptable in a country with no paralytic disease caused by wild type poliovirus. Now it seems that eradication cannot be achieved with IPV. What can be done about this conundrum? OPV should be used to eradicate remaining pools of wild type poliovirus in endemic countries (Nigeria, Afghanistan, Pakistan). At the same time environmental surveillance must be done in all countries that exclusively use IPV. If wild type poliovirus is found in the sewage of such countries, then introduction of OPV, in children previously immunized with IPV, should be considered to eliminate the reservoir of will type virus. It will be important to observe the effect of the distribution of OPV in Israel on the circulation of wild type poliovirus. *Infectious poliovirus was isolated by adding sewer and stool filtrates to monolayers of L20B cells, which are mouse fibroblasts that produce the cellular receptor for poliovirus. These cells were produced in my laboratory, and are useful for isolating polioviruses because they are not susceptible to infection with non-polio enteroviruses. I am pleased to be able to contribute to efforts to control poliomyelitis. immunity, to tackle this problem. I think you misunderstood … IPV does not cause wild virus … you can genetically test the virus .. IPV sometimes causes IPV polio when someone who is not vaccinated comes in contact with the IPV polio virus shed by the vaccinated person. I came in to that conclusion based on the following quote from the above article. Though the virus will not cause CNS infections, it can still circulate among IPV vaccinated populations. IPV, by definition, does not shed. OPV does. Shedding of OPV per se, of course, does not cause paralytic poliomyelitis in others; if the vaccine strain mutates along the way, though, you can wind up with a vaccine-derived poliovirus (VDPV), which can revert to virulence. This becomes an issue in areas with inadequate coverage, because the longer a VDPV circulates, the more opportunity it has. Good thinking – it is quite possible that oral administration of a killed virus (=IPV) or recombinant virus-like particle (VLP) vaccine could do exactly that, and in the same tissues presently infected by the OPV. That is, gut mucosa. In this vein, I note at least one group is working on a plant-made VLP vaccine candidate: George Lomonossoff’s group at the John Innes Centre in UK have just reported some preliminary work on expressing the CP precursor and 3C proteinase in plants, which looks promising. Thanks Boris .. I reversed the two. Unfort. post polio fatigue levels are running a little high. ”The intestine of Brazilians do not support the replication of wild type poliovirus”, how come? Brazilians are administered with the Sabin vaccine, a live attenuated Polio virus vaccine which acts by inducing local mucosal immunity in the GI tract. This renders the vaccinees immune to wild type Polio viruses, in other words their intestines does not support replication of wild Polio viruses. Many thanks Rohan, I had missed the point. The polio virus is present in sewers of all American cities, its not found because no one looks for it. In fact most deadly pathogens regularly reside in the human body from time to time. of course the polio virus as such is harmless.